Suspects in the case include (from left) Rachid Afatti, Ouziad Younes and Ejjoud Abdessamad. MARRAKESH/STOCKHOLM • The bodies of two Scandinavian hikers, Maren Ueland, 28, and Louisa Vesterager Jespersen, 24, were flown from Casablanca to Copenhagen on Friday, as the Moroccan authorities made nine new arrests over their brutal murder in the kingdom's High Atlas Mountains. "Adventurers", "sociable" and "positive" - these were just some of the descriptions given of the two friends who had been studying outdoor activities at the University of South-Eastern Norway. The pair, Ms Ueland from Norway and Ms Jespersen from Denmark - had decided to go to Morocco for Christmas and arrived for a month-long holiday on Dec 9. They had travelled to the foothills of the 4,167m-tall Mount Toubkal, North Africa's highest peak, not far from the tourist village of Imlil. "The girls took all the necessary precautions before leaving for the trip," Ms Ueland's mother, Irene, told Norwegian's NRK television. Photos of them over the years show them laughing and smiling, often outdoors. Ms Ueland's mother paid tribute to her daughter on Facebook, and also shared a photo of her with her pet dog, a leonberger named Alf Herman. She also told Norwegian newspaper Stavanger Aftenbladet: "Maren disliked Christmas... this throw-away mentality. But at the same time (she) was someone very family-orientated." They were smiling, chatty and sociable. They talked a lot with the other people around. MR RACHID IMERHADE, a mountain guide who had met the two friends a few days before their disappearance in Morocco. "She could have lived where other people would not have believed you could live," her younger sister Malin told the same paper. Ms Jespersen, who is originally from Jutland, in west Denmark, had a rafting licence, according to her profile on social networks, and a love for the outdoors. On Nov 21, she appealed to friends on Facebook for advice about Morocco ahead of the ill-fated trip. "Dear friends, I'm going to Morocco in December. Will some of you be in the area or have hiking friends who know something about Mount Toubkal?" she wrote, according to local media reports. The duo's university is planning a commemoration that will take place on campus early next year. "They were smiling, chatty and sociable," said Mr Rachid Imerhade, a mountain guide who had met the two friends a few days before their disappearance in Morocco. "They talked a lot with the other people around," he added. Ms Jespersen's mother, Helle Petersen, told the Danish newspaper B.T. that her daughter was "always happy and positive. Everyone loved her and she saw the best in everyone". She added that she had warned her daughter about travelling to Morocco "because of the chaotic situation". A source from Imlil, the village near where the two friends were killed, said one of young women was found dead inside their tent while the body of the other was found outside. One of them had been beheaded, according to a source close to the investigation. Morocco's central bureau of judicial investigations last Friday said the new suspects were detained for their "alleged links with the perpetrators of the terrorist act". Police also seized "electronic equipment, a shotgun, knives... a military uniform and materials that could be used to manufacture explosives", it added. 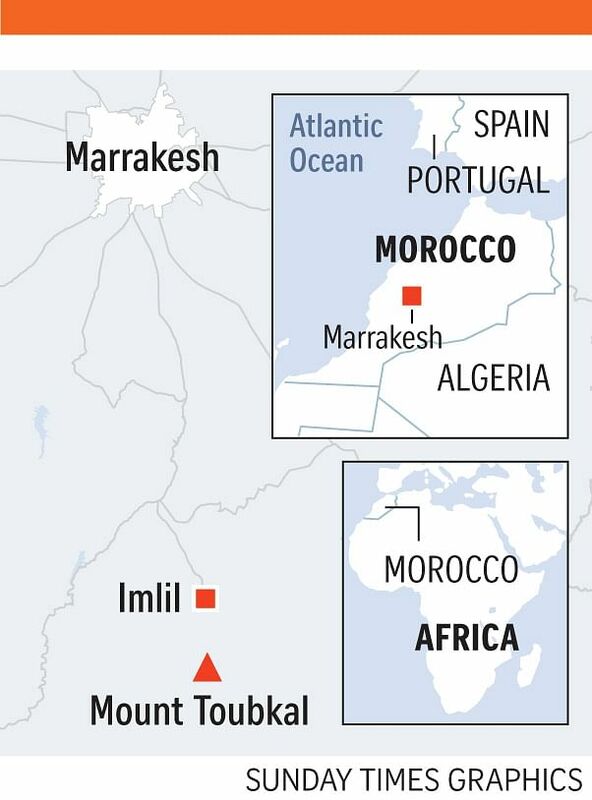 The Moroccan authorities last Thursday said four suspects arrested following the murder of the two tourists had pledged allegiance to the Islamic State in Iraq and Syria (ISIS) group. So far, 13 suspects have been held. Hours after the grisly discovery of the bodies on Monday, the authorities announced the arrest of a first suspect and later said he belonged to an "extremist" group, while the three other suspects were arrested on Thursday. Denmark's PET intelligence service has said that it "shares" the assessment by the Moroccan authorities that the murders were an "act of terrorism". Moroccan investigators are probing a link to Islamist extremism after a video emerged showing the suspects "pledging allegiance" to ISIS, the Rabat prosecutor has said. The authorities are also working to determine the authenticity of a video posted on social media networks allegedly showing the murder of one of the tourists, according to the prosecutor. "At this point, there is no tangible evidence that the video is not authentic," Norway's criminal investigations agency Kripos said on Friday. Denmark's PET agency said "technical analyses have not been completed", but that nothing indicates that the footage is "not genuine". Moroccan government spokesman Mustapha Khalfi described the killings as a "terrorist act" while Prime Minister Saad Eddine El Othmani said it was a "stab in the back of Morocco and Moroccans". Tourism is a cornerstone of Morocco's economy, accounting for 10 per cent of the national income. Morocco has been spared attacks by Islamist militants since 2011, when a bomb attack on a cafe in Marrakesh's famed Jamaa El Fna Square killed 17 people, most of them European tourists.